Vinyl decal featuring image of Elegant Cross with Eternal Flame. This one-piece vinyl sticker is approximately 11 x 6.5 inches. pair of vinyl decals featuring JESUS ICHTHUS. Each one-piece vinyl sticker is approximately 11 x 3 inches. Vinyl decal featuring JESUS in a beautiful script. This one-piece vinyl sticker is approximately 11.5 x 6 inches. 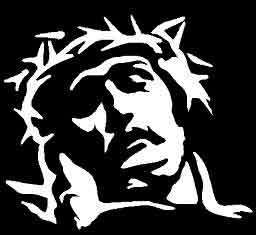 Vinyl decal featuring image of JESUS CHRIST with CROWN OF THORNS. This one-piece vinyl sticker is approximately 9 inches (wide) by 7.5 inches (tall).